1 of 4 Heat oven to 350 degrees F. Line 30 indents of mini muffin pans (using 3 pans total) with paper or foil liners. 2 of 4 Into small bowl, whisk flour, cocoa, chai mix, baking powder and salt. In large bowl, beat butter until smooth. Beat in sugar until fluffy, 3 minutes. Beat in eggs, one at a time. 3 of 4 On low speed, alternately beat flour mixture and milk into butter mixture, beginning and ending with flour. Add vanilla. Divide batter among prepared cups; for ease, place batter in a large plastic bag, snip off a corner and pipe into the cups. 4 of 4 Bake at 350 degrees F until tops spring back when lightly pressed, 15 minutes. 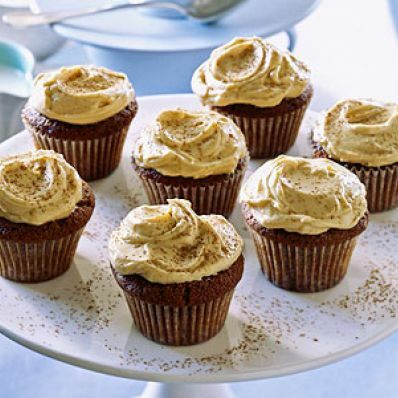 Remove cupcakes from pans to a rack; let cool. 1 of 2 Meanwhile, beat together cream cheese, latte mix, confectioners' sugar and 1 tablespoon milk, if necessary, until smooth. Refrigerate until ready to frost. 2 of 2 Once cupcakes have cooled, spread with frosting, about 1-1/2 teaspoons for each. Dust with additional 2 tablespoons confectioners' sugar and cocoa powder, if desired.